24 hours a day 365 days all year round, to accommodate your needs. In addition to your regular needs, we can also handle urgent requests and emergency situation where your or your clients‘ flights arrive at the Airport late at night, midnight, or in early mornings due to delayed flights when no trains are in operation. Please just call us at the telephone number below, and we can immediately get a bus ready for you and transport you to the destination that you wish. Please contact SANMIKOSAN at 072-463-5778. 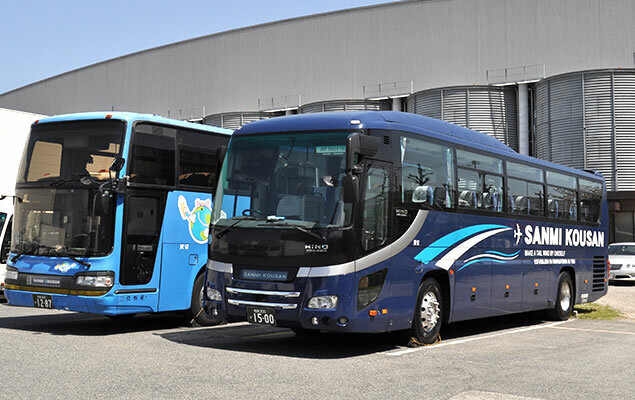 For sightseeing, we provide minibus (less than 20 people) to large bus (more than 20 people) services. We provide chartered bus services with or without a tour guide, catered towards your specific needs. We also transport flight crews to the hotels where they are staying. We also come to your corporate locations for a pickup and transport to the nearest stations or any other locations that you designate.